Some folks are surprised to learn that the Orthodox celebrate Western saints, but it is no different than the Romans’ remembrance of most of the biblical saints who never traveled west or of the thousands of lumen ad revelationem gentium who never knew Latin. However, the celebration of pre-schism Western saints has increased as more Westerners adopt the Orthodox faith. Celtic, English, and Germanic saints like David of Wales, Patrick, Columba, Boniface, and Benedict are quite popular among Western Orthodox Christians. My own patron, Joseph of Arimathea, has a peculiar Western following in Britain due to the legends that he traveled to Roman Britain both before and after Christ’s earthly ministry. The Western rite Orthodox, of whom I have before written, hold Western saints in particular high esteem. For they see them as their own forebears—spiritual ancestors who preached the gospel to their distant grandfathers. Last year, Andrew and I visited one of these parishes on its patronal feast day of Saint Patrick. I had never before celebrated the apostle to Ireland liturgically. You may learn more about Patrick at the Saint Patrick Centre in County Down, Ireland and at OrthodoxWiki, which includes links to several Latin, Orthodox, and secular resources. 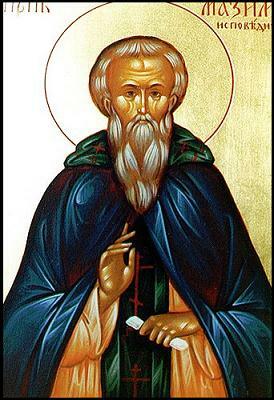 On this fourth Lenten Sunday—that of Saint John of the Ladder—you may wish to read selections from The Ladder of Divine Ascent by the good abbot of Saint Catherine’s Monastery on Mount Sinai. Here is a short sermon by Metropolitan Anthony (Bloom) of Sourozh on this Sunday of Saint John. At the liturgy this morning, I actually thought about Metropolitan Anthony. He had many friends and critics, both in London and throughout the world. He was accused of being a modernist, and it appears that there was a Westernizing culture within many Russian parishes in the United Kingdom. Nonetheless, he contributed much to his flock and to the English speaking Orthodox world. Like other Russian Orthodox modernists, such as Alexander Schmemann, Alexander Men, and John Meyendorff, Metropolitan Anthony engaged the modern world. He and the others helped, and still help, Orthodox Christians who must live in an age largely hostile to Christianity. In this, they are similar to C.S. Lewis. When I was considering Metropolitan Anthony’s legacy this morning, it occurred to me that God sends diverse workers into his vineyards. Though I find the particular modernist tendencies of the hierarch and of the beloved priests previously mentioned somewhat alarming, I believe that their voices and insights—their particular skills and labors—are necessary for a healthy crop. I do not wish to sound like a kumbaya post-Vatican II Latin, but there is something to the “two lung” imagery of the Church. Whether we speak of two lungs or of various organs in the body of Christ like Paul, the society of Christians, like any human society, requires a certain form of diversity. Not necessarily Benetton or Bosnian diversity—I am no multiculturalist—but a variety of personality types, sets of experience, and even competing agendas of emphases. Speaking of Lewis, the wise Anglican remarked about this very need with respect to parochial divisions. He argued that the Church’s traditional geographical division for parishes makes sense because such an arrangement is more likely to provide this sort of necessary diversity in each local Christian community, whereas congregations that have self selected membership tend to become unbalanced and perverse. It seems that something similar is true of the Christian community in general. We need a strong sense of fidelity to the traditions of the Church. In certain American jurisdictions like the Antiochian Archdiocese and the Orthodox Church in America, it is common to hear folks criticize and mock their straw man ethnic traditionalist, often with some slurs against Slavs, monks, the nineteenth century, and the imperial family. They are fond of their big and little “t” distinctions with respect to tradition. I find the modernist, anti-traditional, reductionist elements of that culture quite destructive. I fear that these Orthodox Christians carry some traits disturbingly similar to modernist Protestants and Romans. These folks are vulnerable to the insatiable need always to feel “relevant” to the age at hand. At the same time, we need to engage the modern world and the heathen hegenomic culture in which we have to live. The Church may be an intensive care unit for the spiritually ill, but the admissions door must always be open and the sick must know where the hospital is. The Church cannot be a private care facility for select members only. Metropolitan Anthony and Fathers Alexander, Alexander, and John achieved a productive dialogue about the non-Christian, non-Orthodox, non-ancient, non-Eastern, non-traditional forces in the lives of their flocks for their flocks. They also invited into that dialogue people outside their flocks, bearing witness in love to Christ’s gospel. Even though I think that their modernist streaks were mistaken or imperfect, it is clear from their writings that they were full of the love of God. The tree that bears much fruit is a good tree. These men gave the Orthodox community many bountiful harvests. Sometimes, one hears the martial language of hawks and doves used with respect to Christian controversies. We need both hawks and doves with respect to the engagement of our non-Christian civilization. We need both our Justins and our Tertullians, our Origens and our Augustines—our Justin Popovićs, Seraphim Roses, and John Romanides with our Oliver Cléments, Georges Florovskys, and Thomas Hopkos. It is important to bear in mind the significance of consensus in the Church. We hear of the patristic consensus—the mind of the Fathers—from which the theological speculations of various individual Christian theologians and hierarchs may differ with respect to one issue or another. As Orthodox Christians, we no longer have fundamental theological disputes, which were settled over a millennium ago. However, there are questions relevant to our modern situation that Orthodox Christians must face, such as the proper way to relate to the heterodox, the appropriate Christian response to new technological developments, and how to preach the good news to people in a secular post-Christian culture. Like the older (though far more important) controversies, I suspect that it will take time for the Church to resolve the problems that we face today, but a consensus will emerge, and it will be a consensus not only with respect to the Churches throughout the world but also with respect to the continuity of the apostolic faith. The existential logic of the Christian community, enlightened as it is by the grace of God through the working of the Holy Spirit, will discern the proper path, as it has always done. I believe that Christianity offers no compelling rational arguments for its ultimate truth, and I have always found this disturbing. For it seems that the evidence for deciding the greatest choice should be readily accessible. However, as I have wondered before, it is possible that we do have the means to make an informed decision, though not with discursive reasoning. If so, this arrangement might even be more just. For it is abundantly clear that men are unequal in their philosophical capacities, and if the highest life / salvation / achieving one’s end depended on rationality alone, then very few people, by nature and by circumstance, would have the possibility of attaining God’s desired plan for his creatures. If God desired a communion with mankind through rational means, he would have designed the race more suitably. For Christians, at any rate, the idiot is as able as the scholar to reach God—perhaps more so. Nonetheless, human beings remain rational creatures. It is our nature to employ discursive reasoning. Rationality is one of our excellences; for the philosophical Greeks, it is the chief virtue of man, the “rational animal.” Thus, even as Christians, we should expect a theositic employment of our natural reason. For we should see and glorify God in all things. Moreover, we are by nature agents of truth, and we use our natural reason to disclose truth to us. It is meet and right to use our minds to understand what we can understand about God and his providence. That said, I think that there are many encouraging apologetics for the Christian religion that do not, however, compel reason’s assent. With Thomas, I think that such arguments are useful for those who are already Christians as enlightening confirmations of their faith, as long as we do not pretend that our faith rests on such arguments lest we discredit the gospel before the heathen. If an intelligent pagan asks you why you are a Christian and you respond with some flimsy inconclusive arguments, he may think that such is all that Christianity has going for it. This situation repeats itself endlessly, as Christians often cannot express the reasons for their faith and unbelievers add to their list of reasons why they find Christianity abhorrent. One of these non-compelling arguments involves Christianity’s answer to idolatry. If God is beyond being and if we are to worship nothing but God, then we face an insurmountable difficulty. For anything that we posit as an object of worship will incur the sin idolatry. Any conception that we have in our minds of God will be an idol. For how does one give particular content to a concept that does not thereby make the object of the concept a being among other beings? The ancient Hebrews were the first people to begin to realize the truly supernatural. Having discovered how to speak of a real creator God (rather than a demiurge), they were yet unable to theologize beyond a tribal deity. Furthermore, the practices of the Mosaic religion, without the light of the gospel of which they were types, formed a contradictory tension. Consider the iconic prohibitions in the Law designed to elevate the people beyond crude pagan idolatry, but then think about the immanentist features of Hebraic religion. The Israelite could not depict God, but he knew that God dwelt in the Temple. God had no limitation in time or space, but he sat upon the throne of the cherubim and it was holy. The Lord’s name could not even be spoken, but the Ark of the Covenant was his footstool. Of course, one could argue that philosophical speculation about infinity and limits would not have been very developed among the children of Jacob. Moreover, the Hebraic religion, like all ancient religions, was highly mythological and symbolic. Still, such tensions are latent in the Abrahamic discovery of God’s ultimate transcendence. How can we have any relation to God, who makes all that is from nothing, except as a created image? Christianity resolves this tension, or at least some of it, through the incarnation. While the incarnation itself remains mysterious and unintelligible to our normal categories, it provides an ordering nexus to this problem. For in the incarnation, God becomes a creature and yet remains God. Through Jesus Christ, we have seen God. We can depict God. We can talk about God without having to resort to apophatic gymnastics. Most importantly, Christ allows for the worship of God—in a manner that does not do violence to our nature as limited creatures bound in time and space. The incarnation, in summary, reveals God to the world. The incarnation has always been “unto the Jews a stumbling block, and unto the Greeks foolishness,” but it marks the specific difference of Christianity. As Christians, the incarnation shapes our understanding of God, man, man’s relationship with God, the world, and man’s relationship with the world. The Mosaic features previously mentioned become consistent and intelligible with the revelation of Christ. Indeed, the special relationship of the chosen people with God is revealed as a preparatory unfolding of God’s plan for all beings. God is the transcendent creator who incarnates himself in all being as an image of himself. However, God connects the image and the really real through the incarnation—the ultimate, awesome, cosmic keystone of all reality. It might be useful as an intellectual exercise to think as an enlightened pagan. In such a world view, the divine is transcendent, but the life of here and now—namely, the life lived by human beings—is rather meaningless. We are but shades that never escape the futility of becoming. The wise Buddhist realizes this and seeks to escape it in his own flight to and from nihilism. The Platonist acknowledges that the world of sights and sounds cannot be taken very seriously. As beautiful as contemplation might be, the realization of transcendence pains man because it presents a rift, even an orderly rift, in existence, and we find ourselves on the longing side of the chasm. It was for this reason, I believe, that Nietzsche so emphatically resisted Buddhism, Platonism, and Christianity as siren songs that lead to spiritual decay. I wonder, though, if that beautiful German soul misunderstood the gospel. For the incarnation bridges the gap and, in doing so, renders the image splendorous, as Irenaeus of Lyons taught that Christ recapitulates the whole world in his person. In becoming man, God reveals himself to us, but he also opens up the possibility for us to enter into a communion with God that transcends our creaturely natures through him. Athanasius wrote that God became man so that man might become God. In granting men reason, God provides them with a glimpse of his hyperousia. In the gospel, God offers us the possibility to commune beyond being. I just discovered “OrthodoxTube,” and I found an interesting video on the Putna Monastery in Romania that features several interior icons. You can visit another site on the monastery here, though you may have to reload the page a few times. I also found a video of the monastery in the winter—it features many photographs. It appears to be a picture diary of a pilgrim’s visit to Putna, though the second part seems to be his attack on ecumenism. So, a fellow who both likes natural landscapes and dismisses the ecumenical movement as heretical—my kind of Romanian! Update: The original videos disappeared, but I found similar replacements. You may wish to check out Ancient Faith Radio, which has many interesting music and discussion programs. There are two wonderful posts about faith this week on Fr. Stephen Freeman’s ever edifying Glory to God for All Things site. The first, “Know God or No God,” concerns the Orthodox understanding of faith, while the second explores my favorite modern Orthodox theologian’s treatment of the subject, “Vladimir Lossky on Faith.” I highly recommend reading these short entries; they offer a condensed Orthodox Christian response to the obvious question, “Why believe something for which you have no evidence?” Why should one believe in the Gospel if such belief entails simply blind acceptance? Why not just as well put your trust in the great Flying Spaghetti Monster, as the blasphemous pop cultural phenom mocks? Leo Strauss discusses this problem in his address to the B’nai B’rith Hillel Foundation, “Progress or Return.” Contra Thomas and the Christian philosophical tradition, Strauss the rabbinical Jew / philosophical agnostic argues that one cannot resolve the conflict between Athens and Jerusalem. The religious man accepts the truth of a revelatory tradition, the claims of which are not verifiable by natural reason, but the philosophical man cannot affirm what reason cannot know. There is no way past this problem for Strauss. The scholastic answer ameliorates the tension but does not resolve it. For Thomas, there is no contradiction between faith and reason. Both come from God. Of things known by faith—that is, through revelation—some things can be known through natural reason and some cannot be so known. Thus, one can test a revelatory tradition by examining its teachings in light of natural reason. If its doctrines contradict reason, then one should reject it. Such a method disproves demonstrably false revelatory traditions, but it still cannot affirm the truth of revelation that concerns matters beyond natural reason. In yesterday’s “Paschal Discrepancies,” I briefly explain why the date of Pascha often differs for the West and for the Orthodox Church. Today’s post concerns the differences in the calculation for Great Lent. As yesterday’s entry states, if Pascha falls on the same day in both the West and the Orthodox Church, Great Lent begins two days earlier for the Orthodox on Clean Monday, whereas Lent starts on Ash Wednesday for the West. These differences go back to the early centuries of the Church, long before the schism of Christendom. As I understand it, the Christian observance of Lent developed alongside catechumens’ preparation for holy baptism. Certain feasts were favored occasions for the baptism of converts, especially the feasts of Theophany that commemorates the baptism of Christ by John in the River Jordan and of Pascha itself—often on Holy Saturday before the feast of feasts. The Christian community fasted before the great feast, and the catechumens fasted before baptism. The Christian community looked after the catechumenate and began to fast with the proselytes in solidarity, and the two parallel preparations mutually influenced each other and evolved into the fast of Great Lent. At first, the fast was only three days, and then Holy Week developed. In time, as catechumens followed the Jewish practice of forty days of preparation, following Christ’s example in the wilderness, the Church entire came to observe a forty day fast in spiritual preparation for Pascha. Nonetheless, East and West considered the forty days differently. In the West, Sundays were not considered fast days. Hence, the Western Churches needed to move the beginning of the fast back six days to account for the five Sundays of Lent and the sixth Sunday skipped in the counting back. Thus, Lent begins on Ash Wednesday for the West instead of a possible Ash Tuesday. Sundays are numbered among the forty days in the East, which would make the Orthodox observance of Lent begin on the Tuesday after Western Ash Wednesday. However, Holy Week from Lazarus Saturday until Holy Saturday is considered its own fasting period in the Orthodox Church. Thus, the forty days end on the Friday before Lazarus Saturday (the day before Palm Sunday), but the fast continues during Holy Week. That is why Clean Monday falls two days before Ash Wednesday rather than six days after. History is yet more messy—and more interesting. In the Holy Land, the Lenten calculation of forty days excluded not just Sundays but the sabbath day, as well. The Palestinian tradition also considered Holy Week as its own fast. Thus, Christians in Palestine began their fast a week earlier than other Eastern Christians to account for all the exempted Saturdays and Sundays. As the two Eastern practices merged, Eastern Christians developed a hybrid Lenten tradition wherein the week before Lent is a semi-Lenten “Cheesefare” week. During this week, one may still consume dairy goods but one can no longer eat meat. Moreover, one can see the compromise, as well, in the relaxed provisions for Saturdays and Sundays during the great fast; one can consume wine and oil on Saturday and Sunday but not during the week. The actual provisions of the fast were quite similar in the East and West until the early modern period, and you can see the remnants of the old Western practice in the pre-Lenten traditions of Western cultures. Consider, for example, the practice of eating English pancakes or Polish pączki to use up butter, eggs, and milk before Lent. I am not sure when fish became acceptable as a Lenten food in the West, though perhaps that difference is quite ancient. The East allows invertebrates and honey as the only permissible animal products during Lent in honor of John the Baptist, who survived on locusts and honey. The West may have always allowed fish because of their special status in Christian symbolism. Great Lent for the Orthodox begins on Clean Monday rather than the West’s Ash Wednesday. So, if the feast of Pascha or Easter falls on the same day for both the Orthodox Church and the West, Lent begins two days earlier for the Orthodox. However, you might first wonder why Pascha often falls on different days. In the early Church, different Christian communities observed the resurrection of the Lord according to various methods. The Churches of some regions celebrated the feast according to the Jewish lunar calendar, while other Churches insisted that the feast always fall on the first day of the week—Sunday. At the first Council at Nicea in A.D. 325, the assembled bishops agreed on a standard and universal formula for dating Pascha. Pascha is to be celebrated on the first Sunday after the first full moon after the vernal equinox, as long as the Jewish passover has already occurred. However, discrepancies continued because different regions observed different dates for the vernal equinox and had different calculation methods for predicting the lunar cycles. Eventually, the Churches adopted standard calculation methods and a standard date for the vernal equinox—March 21—instead of relying on the actual astronomical phases of the moon and vernal equinox that falls on different days around March 21, depending on the year. For all Christians to celebrate Pascha on the same day, without precise astronomical instruments and easy long-distance communication, it was practically necessary to adopt such uniform standards. Though the council issued the new universal system, it still took several centuries for every Christian region to accept it. After universal acceptance, Pascha was celebrated on the same day until the Roman Pope Gregory XIII reformed the calendar in A.D. 1582. The Orthodox Church never accepted Rome’s unilateral calendar change. Since then, the date of March 21 on the Julian and Gregorian calendars has differed. Such explains the frequent discrepancy of date for the celebration of Pascha. In this year of our Lord 2009, for example, Gregorian Pascha falls on April 12, while Orthodox Pascha falls one week later on April 19. Today is Forgiveness Sunday in the Orthodox Church, the last day before the beginning of Great Lent, when it is customary for everyone to ask everyone else for forgiveness. Today also commemorates the Fall and the consequent exile of Adam and Eve from Eden. The complementary opposite is Pascha itself, where we celebrate the achievement of such forgiveness and the consequent overcoming of the Fall. The two feasts frame the Lenten fast and the very meaning of our religion. I find the mercy of God as both evidence for and a stumbling block to the truth of the Christian message. The part of my soul sympathetic to the Gospel meekly bows before indiscernible divine judgments, while the skeptical part cannot shake the sense that Christianity teaches a ridiculous form of injustice. I wonder if Nietzsche is justified in his revulsion of the New Testament, where righteous men obsessively wrestle with the most petty disturbances of their souls. From the epistles of Saint Paul, it does not take many mutations to arrive at the hideous spirituality of medieval self-flagellation. At the same time, the Good News appears to exhort men to inhuman degrees of tolerance and mercy which tend to threaten the well-being of its sincere practitioners. How is it sensible to forgive a man hundreds of times for the same offense? Why should we turn the other cheek? The madness of loving one’s enemies and self-abnegation—the ascetic religion’s milk and honey—makes me question whether Jesus Christ came to fulfill the divine economy or to spawn a thousand dangerously idiotic ideologies upon mankind. What salvation is there in making men into voluntary slaves? Yet, for millennia, Christians maintained their sanity. Christendom did not hesitate to defend itself from the barbarians. Christian men remained men and were not eunuchs for the sake of heaven. As I asked before, was this due to their hypocrisy, as our latter day fools teach, or did they understand better as a society the subtlety of Christian doctrine? Does Nietzschean disgust result from Christianity per se or from the Gospel’s modern degradations? As a modern, it is difficult to approach the statements of Christ without hearing them through the medium of the contemporary world view, just as it is difficult for someone who has been tainted with Calvinism to read Saint Paul without seeing in his works Calvin’s ugly theology. Modernity’s oozing sludge debases out hermeneutic abilities and corrupts all that we see. When I listen to the parables of Christ, I confess that I wonder if a Jew really did poison Western Civilization’s life source well. Germany’s neo-pagans thought so, and the more miserable recesses of my soul worry that they might have been correct. It has been over a decade since I lost my unquestioning blessed assurance, and since then I have endlessly argued with myself about the ultimate questions. Was the wisdom of Christianity simply its residual Hellenism, complicated and distorted by barbarian superstition? Or, rather, is the wisdom of men quite insufficient to comprehend majestic providence? When I consider the saints and the beautiful fruits of Christian civilization, in word, deed, and stone, Nietzschean suspicions fade away. What folly could produce Ignatius, Irenaeus, Origen, Anthony of Egypt, Gregory of Nyssa, John Chrysostom, Benedict, John of Damascus, Bonaventure, Thomas Aquinas, Thomas More, Seraphim of Sarov, and the thousands upon thousands of great lights that have illumined the world? What morbid slave morality could have achieved the Church of Holy Wisdom, the cathedrals of the High Middle Ages, or the splendors of the Renaissance? The charity of the Franciscans, the music of Bach, and the modern development of natural philosophy came to be in Christian civilization. The pagan Greeks at their cultural epitome never reached such glory, and a mechanistic understanding of “progress” does not impress me as an explanation for these facts. We do indeed see through a glass darkly . . . woefully so.